Start your morning with our fresh baked assorted muffins , Scones,Includes fresh fruit tray, and assorted chilled juice. Start with our fresh baked cinnamon rolls, assorted muffins , Includes fresh fruit tray, yogurt, and assorted chilled juice. (sliced honey glazed ham, bacon or sausage links), breakfast style potatoes accompanied by warm tortillas, sour cream, and homemade salsa to create your own burritos, fresh fruit tray, and assorted chilled juice. Fresh eggs, sausage, ham, red or green peppers, mixed cheese with spices & includes: sour cream, salsa, fruit tray and juice. Assorted bagels, assorted cream cheese, muffins, bread, fresh fruit and juice. 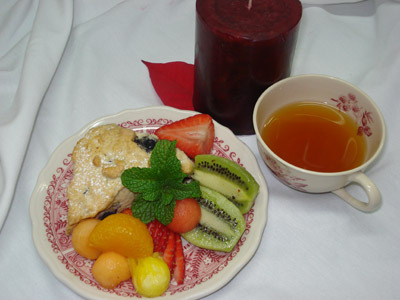 Start with our fresh coffee, Boiled egg, biscuit, Country Gravy and Fresh Baked Scones with Fruit! Start with your choice of two kinds of quiches. Ham & Cheese, Sausage Cheese, Vegetarian Quiches,Includes: Sour Cream, Salsa, Fresh Fruit and Juice. Get our wonderful Coffee or Tea Service.